Louis being an idiot with Stan. . Wallpaper and background images in the Louis Tomlinson club tagged: ♥ fan art louis tomlinson random 1d one direction tumblr. 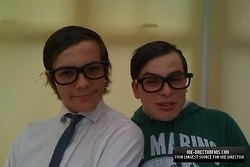 Louis is just being silly with Stan lol!